FILE - Ugandan President Yoweri Museveni speaks to reporters at the Akasaka Palace state guesthouse in Tokyo, Sept. 12, 2015. Uganda's electoral commission approved on Tuesday veteran leader Yoweri Museveni's bid to extend his three decades in office, kicking off campaigning for the presidential election due in early 2016. The commission also gave the green light to Museveni's ally-turned-rival Amama Mbabazi, a former prime minister, to run in the election. Museveni, 71, in power since 1986, is one of Africa's longest-ruling leaders. His critics accuse him of wanting to be president for life and of grooming his son, army brigadier Kainerugaba Muhoozi, to succeed him, charges he denies. Opposition leaders had initially planned to challenge Museveni as a coalition, but were unable to unite behind a single candidate. "The reason I keep coming up is because I am able to do the work," Museveni said on Tuesday, touting his role in leading Uganda to strong economic growth and a measure of political stability after years of turmoil. "We're now at a stage for take-off," he said. Mbabazi, who was sacked as prime minister in 2014, had originally stood against Museveni as a candidate for the nomination of Uganda's ruling National Resistance Movement (NRM) but will now run on an independent ticket. 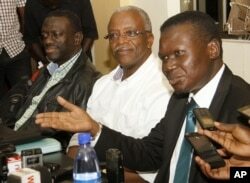 FILE - Uganda opposition leaders, from left to right: Forum for Democratic Change, Dr. Kizza Besigye, former Prime Minister Amama Mbabazi and Democratic Party President Norber Mao meeting at the Democratic Alliance office in Kampala, Sept. 18, 2015. Mbabazi said on Tuesday he aimed to help ensure "a peaceful transition... a change-over from one generation to the next." A third candidate, long-time opposition figure Kizza Besigye who has been nominated by Uganda's largest opposition party, Forum for Democratic Change (FDC), is expected to be registered on Wednesday as a candidate in the presidential election. Museveni has appeared keen to show his physical agility amid rumors of failing health. At a weekend NRM conference he was shown on television running from his seat to the podium. The electoral commission said it would likely approve the candidacy of 10 presidential candidates, although the main contest is expected to be between Museveni, Mbabazi and Besigye. Mbabazi and Besigye have said they have not abandoned hopes of agreeing on a single opposition candidate to challenge Museveni, but mutual suspicions remain strong. Ugandan political analyst Nicholas Ssengoba said the chances of such an agreement were now virtually nil. "After the nominations, so much is at stake now. Egos are in, a coalition just won't happen," he said.